Why do I need to receive personal revelation? Who is the Holy Ghost and how does He work? Why must I pray in faith? What is the role of the Spirit in missionary work? How can I recognize the promptings of the Spirit? Joseph Smith said, “Salvation cannot come without revelation; it is in vain for anyone to minister without it” (Discourse, between circa 26 June and circa 4 August 1839-A, as reported by Willard Richards, Church History Library, The Church of Jesus Christ of Latter-day Saints, Salt Lake City). You will succeed in your work as you learn to receive and follow personal revelation. Joseph Smith also taught that revelation is vital for your daily work: “This is the principle on which the government of heaven is conducted—by revelation adapted to the circumstances in which the children of the kingdom are placed” (History, 1838–1856, volume D-1 [1 August 1842–1 July 1843, Church History Library, The Church of Jesus Christ of Latter-day Saints, Salt Lake City]). God loves you and all His children. He is anxious to support you in your practical and specific challenges. You have been promised inspiration to know what to do and have been given the power to do it (see Doctrine and Covenants 43:15–16). He will help you as you try to recognize and understand the Spirit through diligent scripture study. He will guide you to people who will receive the message of the Restoration. He will give you power to deliver the message and to testify of Christ and His gospel. He will shower His blessings upon you through the gift of the Holy Ghost. He asks that you remain worthy of this gift and that you ask, seek, and knock (see Doctrine and Covenants 4:7; Matthew 7:7–8). We live in the day prophesied by Book of Mormon prophets—a day when people will “contend one with another, and they shall teach with their learning, and deny the Holy Ghost, which giveth utterance” (2 Nephi 28:4; see also 3 Nephi 29:6; Mormon 9:7–8). Yet many people also yearn for spiritual things. As you learn to receive personal revelation, you will teach with power and authority (see Alma 17:3) because the Holy Ghost gives you power to speak (see 1 Nephi 10:22). You need to seek and receive personal revelation through the Holy Ghost as you help people become baptized and confirmed. Have faith that you will receive personal revelation to guide you from day to day. The Holy Ghost will help you in every aspect of your work. A person is capable of receiving spiritual guidance before being baptized and confirmed. This spiritual influence begins with the Light of Christ, which “is given to every man, that he may know good from evil” (Moroni 7:16; see also verses 14–19). “The light of Christ should not be confused with the personage of the Holy Ghost, for the light of Christ is not a personage at all. Its influence is preliminary to and preparatory to one’s receiving the Holy Ghost. The light of Christ will lead the honest soul who ‘hearkeneth to the voice’ to find the true gospel and the true Church and thereby receive the Holy Ghost” (Bible Dictionary, “Light of Christ”; see also Doctrine and Covenants 84:46–47). President Boyd K. Packer said: “It is important for a … missionary … to know that the Holy Ghost can work through the Light of Christ. A teacher of gospel truths is not planting something foreign or even new into an adult or a child. Rather, the missionary or teacher is making contact with the Spirit of Christ already there. The gospel will have a familiar ‘ring’ to them” (“The Light of Christ” [address given at the seminar for new mission presidents, June 22, 2004], 2, Church History Library, Salt Lake City). The personage of the Holy Ghost. The Holy Ghost is the third member of the Godhead. He is a personage of spirit and does not have a body of flesh and bones (see Doctrine and Covenants 130:22). He is the Comforter, who the Savior promised would teach His followers all things and bring to their remembrance all things that He had taught them (see John 14:26). The power of the Holy Ghost. The witness that comes to sincere seekers of truth before baptism comes through the power of the Holy Ghost. “The power [of the Holy Ghost] can come upon one before baptism and is the convincing witness that the gospel is true. By the power of the Holy Ghost a person receives a testimony of Jesus Christ and of His work and the work of His servants upon the earth” (Bible Dictionary, “Holy Ghost”). The Holy Ghost testifies of truth. All people can know the truthfulness of the Book of Mormon through the power of the Holy Ghost. “By the power of the Holy Ghost ye may know the truth of all things” (Moroni 10:5). The gift of the Holy Ghost. People who receive a witness but have not been baptized and confirmed do not yet have the promise of the constant companionship of the Holy Ghost. Joseph Smith said: “There is a difference between the Holy Ghost and the gift of the Holy Ghost. Cornelius received the Holy Ghost before he was baptized, which was the convincing power of God unto him of the truth of the Gospel, but he could not receive the gift of the Holy Ghost until after he was baptized. Had he not taken this sign or ordinance upon him, the Holy Ghost which convinced him of the truth of God, would have left him” (“Sabbath Scene in Nauvoo,” Times and Seasons, Apr. 15, 1842, 752). “The gift [of the Holy Ghost] can come only after proper and authorized baptism, and is conferred by the laying on of hands. … The gift of the Holy Ghost is the right to have, whenever one is worthy, the companionship of the Holy Ghost” (Bible Dictionary, “Holy Ghost”). As a member of the Church, you have received the gift of the Holy Ghost by priesthood authority. This gift entitles you to the constant companionship of the Holy Ghost as you remain worthy of it. Pray for the Spirit’s guidance, and valiantly follow the promptings you receive. The Holy Spirit of Promise. The Holy Ghost is also referred to as the Holy Spirit of Promise (see Doctrine and Covenants 88:3). To be sealed by the Holy Spirit of Promise means that the Holy Ghost confirms that righteous acts, ordinances, and covenants are acceptable to God. The Holy Spirit of Promise testifies to the Father that the saving ordinances have been performed properly and that the covenants associated with them have been kept. Those who are sealed by the Holy Spirit of Promise receive all that the Father has (see Doctrine and Covenants 76:51–60; Ephesians 1:13–14). All covenants and performances must be sealed by the Holy Spirit of Promise if they are to be valid after this life (see Doctrine and Covenants 132:7, 18–19, 26). Breaking covenants may remove the sealing. Gifts of the Spirit. The gifts of the Spirit are special spiritual blessings that the Lord gives to worthy individuals for their own benefit and for their use in blessing others. For example, missionaries who must learn a new language may receive the gift of tongues to give them divine help in learning a language. Several gifts of the Spirit are described in Moroni 10:8–18; Doctrine and Covenants 46:11–33; and 1 Corinthians 12:1–12. These are only some examples of the many gifts of the Spirit. The Lord may bless you in other ways depending on your faithfulness, your needs, and the needs of those you serve. You should desire spiritual gifts and earnestly seek for them (see Doctrine and Covenants 46:8; 1 Corinthians 12:31; 14:1, 12). These gifts come by prayer, faith, and works, according to God’s will (see Doctrine and Covenants 63:9–12; 84:64–73). Write a description of the nature and role of the Holy Ghost. How did Peter and John seek spiritual gifts? How did the Lord answer their prayers? What can you learn from this experience about your own work? “We must understand what [a person] must feel in order to receive conversion. “We must understand how a missionary must feel in order to teach with the converting power of the Spirit. “And then we must understand how a member must feel to succeed in participating in the conversion experience” (mission presidents’ conference, Apr. 3, 1985). Be edified and have your mind enlightened as you search the scriptures and teach the doctrine. Create a climate when you teach in which the Holy Ghost can bear witness. You do this by teaching and testifying of the message of the Restoration. Teach as directed by the Spirit, and testify that you know by the power of the Holy Ghost that what you teach is true. Follow the guidance of the Spirit in adapting the message to each person’s needs. Invite people to act. Their faith will grow as they repent, obey the commandments, and make and keep covenants. President M. Russell Ballard spoke of the power of the Spirit: “True conversion comes through the power of the Spirit. When the Spirit touches the heart, hearts are changed. When individuals … feel the Spirit working with them, or when they see the evidence of the Lord’s love and mercy in their lives, they are edified and strengthened spiritually and their faith in Him increases. These experiences with the Spirit follow naturally when a person is willing to experiment upon the word. This is how we come to feel the gospel is true” (“Now Is the Time,” Ensign, Nov. 2000, 75). The Holy Ghost works in the hearts of people to bring about these changes. As people choose to keep commitments, they will feel the power of the Holy Ghost more strongly and will develop the faith to obey Christ. Thus, you should help the people you work with grow in faith by inviting them to repent and to make and keep commitments. Read one or two of the following passages, and ponder what a person must feel to be converted. Record your feelings and impressions in your study journal. Discuss your ideas with other missionaries and members. Read one or two of the following passages and ponder what you as a missionary and as a member must feel to teach with converting power. Record your feelings and impressions in your study journal. Discuss your ideas with other missionaries and members. What do these scriptures teach about the power of the Spirit in your work? What can you do to enjoy the power of the Spirit in your work? Why is it important to teach what you know and believe? You can teach in the Lord’s way only by the power of the Spirit, and you receive the Spirit through the prayer of faith. The Lord said, “And the Spirit shall be given unto you by the prayer of faith; and if ye receive not the Spirit ye shall not teach” (Doctrine and Covenants 42:14). As you pray for help in your teaching, the power of the Holy Ghost will carry your teachings “unto the hearts of the children of men” (2 Nephi 33:1). “I always remember two young men who served in my mission. One was a superstar. He was educated. He was bright. He was quick. He was a little arrogant. We had another who was a sign painter. He came from a sign shop with very little education, but he knew his inadequacies and he relied on the Lord. When he prayed, you knew he was talking with the Lord. It wasn’t a rote thing, it was a conversation and that young man accomplished wonders while the other young man went through the motions. The power that was in the one and the absence of power in the other was so apparent. Call upon the Lord. He has extended the invitation, and He will answer” ( Teachings of Gordon B. Hinckley , 469). Use the language of prayer, which shows that you love and respect your Heavenly Father. Use proper and respectful language in whatever language you speak. For example, in English use scriptural pronouns such as Thee, Thou, Thy, and Thine. Always express gratitude for your blessings. A conscious effort to be grateful will help you recognize how merciful the Lord has been in your life. Pray specifically for the guidance and help of the Holy Ghost. Show that you value this blessing by being sensitive to and aware of spiritual promptings. Then courageously follow those promptings. Pray with love and charity. Pray for people by name. Ask for inspiration to help you understand and meet their needs. Pray for the welfare of those you are teaching, new converts, and returning members. Pray for the members and priesthood and auxiliary leaders in your area. Pray for your family at home. Pray for your companion, other missionaries, and your mission president. Pray to know how you can help others, and then be willing to sacrifice in their behalf. Pray that you will be shown where to go and what to do. Pray that you will be led to those who are prepared to receive the message of the Restoration. Pray that you will recognize them. Recognize that your Heavenly Father knows what you need better than you do. Rely on the Spirit to know what to pray for (see 3 Nephi 19:24; Doctrine and Covenants 46:28, 30). In your prayers at night, give the Lord an accounting of your day’s activities. Then review with Him your plan for the next day. Listen for the promptings of the Spirit. Pray to overcome temptation. Yielding to temptation interferes with the Spirit. Pray and, when appropriate, fast for special blessings. Pray about and ponder the scriptures. The scriptures open the window to revelation. Believe that God will answer your prayers. Recognize that God’s thoughts are not your thoughts (see Isaiah 55:8–9), and trust God to answer your prayers in His own way and in His own time. “The trouble with most of our prayers is that we give them as if we were picking up the telephone and ordering groceries—we place our order and hang up. We need to meditate, contemplate, think of what we are praying about and for and then speak to the Lord as one man speaketh to another” ( Teachings of Presidents of the Church: Gordon B. Hinckley , 114). “If prayer is only a spasmodic cry at the time of crisis, then it is utterly selfish, and we come to think of God as a repairman or a service agency to help us only in our emergencies. We should remember the Most High day and night—always—not only at times when all other assistance has failed and we desperately need help” ( Teachings of Presidents of the Church: Howard W. Hunter , 80). 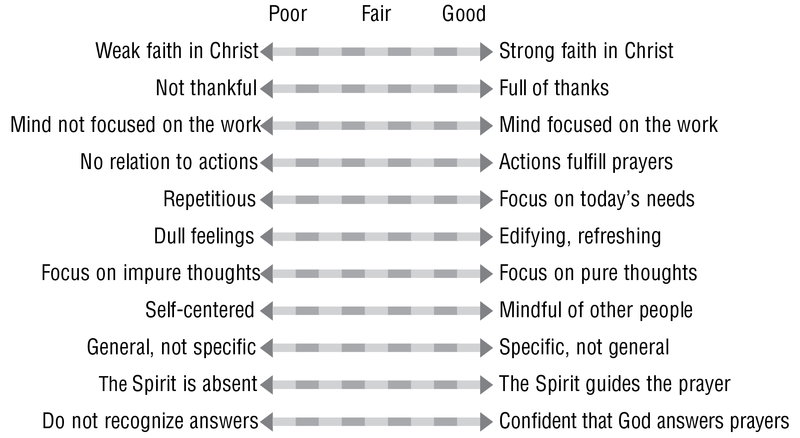 Using the following scale, privately evaluate your prayers. In your study journal, write answers to questions like these: Where would you place yourself on this scale? Where would you like to be on this scale? How are you going to change? Why must you pray for the Spirit? Many voices in the world compete for your attention, and they can easily drown out spiritual impressions if you are not careful. “You recognize the promptings of the Spirit by the fruits of the Spirit—that which enlighteneth, that which buildeth up, that which is positive and affirmative and uplifting and leads us to better thoughts and better words and better deeds is of the Spirit of God” ( Teachings of Gordon B. Hinckley, 260–61). God answers your prayers through personal inspiration and revelation. Through the Holy Ghost He will guide you in your finding efforts, as you teach the restored gospel, and as you strengthen returning members and new converts. Your task is to live worthily, pray fervently, and learn to recognize and follow courageously the Spirit’s guidance. “No man can preach the Gospel without the Holy Ghost” (History, 1838–1856, volume B-1 [1 September 1834–2 November 1838], 756, Church History Library, The Church of Jesus Christ of Latter-day Saints, Salt Lake City). “Some few were called and ordained by the Spirit of revelation and prophecy, and began to preach as the Spirit gave them utterance, and though weak, yet were they strengthened by the power of God” (Orson Pratt, A[n] Interesting Account of Several Remarkable Visions [Edinburgh: Ballantyne and Hughes, 1840], 24). “[Joseph Smith] proceeded to give instruction to the Elders respecting preaching the Gospel, and pressed upon them the necessity of getting the Spirit, so that they might preach with the Holy Ghost sent down from heaven” (History, 1838–1856, volume C-1 [2 November 1838–31 July 1842], 969, Church History Library, The Church of Jesus Christ of Latter-day Saints, Salt Lake City). During your weekly and daily planning sessions, you will need to ask some basic questions every day—even many times each day (see the “Scripture Study” box that follows for examples of questions). Seek inspiration to answer these questions in a way that meets each situation. The answers should then take shape in your plans. But you should also be willing to follow the Spirit and change your plans when unforeseen opportunities arise. Study the following scriptures and consider how they answer these important questions that you should ask each day. Consider what these passages mean for your finding efforts, planning sessions, and personal and companion study. Also consider their meaning as you teach the lessons, invite people to make commitments, follow up on commitments, strengthen new members and returning members, and work with members. How do I adapt my teaching to the needs of those I teach? Which scriptures should I use and how should I use them? President Howard W. Hunter offered this counsel: “Let me offer a word of caution. … I think if we are not careful … , we may begin to try to counterfeit the true influence of the Spirit of the Lord by unworthy and manipulative means. I get concerned when it appears that strong emotion or free-flowing tears are equated with the presence of the Spirit. Certainly the Spirit of the Lord can bring strong emotional feelings, including tears, but that outward manifestation ought not to be confused with the presence of the Spirit itself” ( The Teachings of Howard W. Hunter , 184). The Spirit of the Lord always edifies. Revelation and spiritual experiences are sacred. They should be kept private and discussed only in appropriate situations. As a missionary, you may be more aware of spiritual experiences than you have been earlier in your life. Resist the temptation to talk freely about these experiences. President Boyd K. Packer counseled: “I have learned that strong, impressive spiritual experiences do not come to us very frequently. And when they do, they are generally for our own edification, instruction, or correction. Unless we are called by proper authority to do so, they do not position us to counsel or to correct others. “I have come to believe also that it is not wise to continually talk of unusual spiritual experiences. They are to be guarded with care and shared only when the Spirit itself prompts you to use them to the blessing of others” (“The Candle of the Lord,” 53). Relying on the Spirit is so important that the Lord warns us very strongly not to deny or quench the Spirit. What do you learn from the following passages of scripture? Pray with faith that your prayers will be answered. Learn to understand, recognize, and follow the promptings of the Spirit. Learn to rely on the Spirit to show you where to go, what to do, and what to say. Teach others how to recognize the Spirit. Record your spiritual experiences in your journal. For example, answer questions such as: Have I understood something better as I have studied the scriptures? Have I had unusual opportunities to meet people with whom I could share a message? Have I been given words to say at the moment I needed them? Have I had strong feelings of love for the people I have met? How have my prayers been answered? Divide a page into two columns. Label one column “What the Lord Did” and the other column “What Lehi or Nephi Did.” Read the story of the Liahona and the broken bow (1 Nephi 16:9–30) or the story of Nephi building a ship (1 Nephi 17:7–16; 18:1–6). As you read, list events from the story in the appropriate columns. Consider what the story can teach you about the nature of inspiration. Look through your journal and find occasions when you have been led by the Spirit or have experienced revelation or another gift of the Spirit. Think about when, where, and why these experiences happened. Did you do anything in particular to prepare yourself for such an experience? How was the Lord’s hand manifest in the experience? How did you feel? What can you do to have similar experiences? Remembering these experiences can help you recognize and receive the Spirit once again. The book of Acts in the Bible has been called the “Book of the Acts of the Holy Spirit through the Apostles.” Read the chapter headings of the book of Acts and explain why this title may be appropriate. Find evidence to justify your explanation. Study and ponder the following counsel. How does it relate to your daily missionary activities? “Tell the brethren to be humble and faithful and be sure to keep the Spirit of the Lord, that it will lead them aright. Be careful and not turn away the still, small voice; it will teach them what to do and where to go; it will yield the fruits of the kingdom. Tell the brethren to keep their heart open to conviction, so that when the Holy Ghost comes to them their hearts will be ready to receive it. They can tell the Spirit of the Lord from all other spirits—it will whisper peace and joy to their souls; it will take malice, hatred, strife and all evil from their hearts, and their whole desire will be to do good” (quoted in Juvenile Instructor, July 19, 1873, 114). The Prophet Joseph Smith gave this counsel to Brigham Young in a dream almost three years after Joseph Smith’s death. If you were in Brigham Young’s place and received this counsel, what would you do? Study Alma 33:1–12; 34:17–29, 38. What questions was Alma answering? (Review Alma 33:1–2.) How did Alma answer these questions? What assurances did he give that God hears and answers prayers? The Lord has promised that the Spirit will guide us in many important ways. As you read the following passages, identify aspects of your work that require the guidance of the Spirit. What do the commandments and promises contained in the following scriptures mean for your personal and companion study? for district council, zone conferences, baptismal services, and other meetings? Read the following scripture passages (including the headings to these sections). In this account, what was very important to the Lord? What did not matter to the Lord? “[A person may have] a strong desire to be led by the Spirit of the Lord but … unwisely extends that desire to the point of wanting to be led in all things. A desire to be led by the Lord is a strength, but it needs to be accompanied by an understanding that our Heavenly Father leaves many decisions for our personal choices. Personal decision making is one of the sources of the growth we are meant to experience in mortality. Persons who try to shift all decision making to the Lord and plead for revelation in every choice will soon find circumstances in which they pray for guidance and don’t receive it. For example, this is likely to occur in those numerous circumstances in which the choices are trivial or either choice is acceptable. “We should study things out in our minds, using the reasoning powers our Creator has placed within us. Then we should pray for guidance and act upon it if we receive it. If we do not receive guidance, we should act upon our best judgment. Persons who persist in seeking revelatory guidance on subjects on which the Lord has not chosen to direct us may concoct an answer out of their own fantasy or bias, or they may even receive an answer through the medium of false revelation” (“Our Strengths Can Become Our Downfall,” Ensign, Oct. 1994, 13–14). What is the relationship between following your own judgment and relying on the Spirit? Believe that God will give you what you ask for in righteousness? Acknowledge and give thanks for answers to your prayers? Pray for people by name and consider their needs? Pray for each other and for the Spirit to guide you? Receive answers to your prayers? Discuss as companions how you will seek the Spirit more earnestly. Discuss the different ways that people describe the influence of the Holy Ghost. Write comments that those you teach have made about their experiences with the Spirit in learning the gospel and trying to keep commitments. How can you help others recognize this sacred influence? How can you avoid being manipulative as you do so? Consider and discuss how the following counsel applies to you: “You cannot force spiritual things. Such words as compel, coerce, constrain, pressure, demand, do not describe our privileges with the Spirit. You can no more force the Spirit to respond than you can force a bean to sprout, or an egg to hatch before its time. You can create a climate to foster growth, nourish, and protect; but you cannot force or compel: you must await the growth” (Boyd K. Packer, “The Candle of the Lord,” 53). Discuss the following statements and how these principles can change both your prayers and your work. How can your prayers influence your planning, goal setting, work, and activities each day? “Our deeds, in large measure, are children of our prayers. Having prayed, we act; our proper petitions have the effect of charting a righteous course of conduct for us” (Bruce R. McConkie, “Why the Lord Ordained Prayer,” Ensign, Jan. 1976, 12). “Sincere praying implies that when we ask for any blessing or virtue we should work for the blessing and cultivate the virtue” (David O. McKay, Secrets of a Happy Life , 114–15). “Ask [God] to put you just where he wants you, and to tell you what he wants you to do, and feel that you are on hand to do it” (Brigham Young, Discourses of Brigham Young, sel. John A. Widtsoe , 46). Present a lesson on using proper and respectful language in prayer. As appropriate, have missionaries share a story or experience they heard in a recent testimony meeting, teaching experience, or other setting. The spiritual stories and experiences other people tell can help you develop faith and recognize that the Spirit’s influence is widely and frequently manifest. Express gratitude for manifestations of the Lord’s hand in your work (see Doctrine and Covenants 59:21). Discuss how expressing gratitude helps you see the small but very significant ways the Lord blesses you (see Ether 3:5). Ask the missionaries to give talks about the mission and power of the Holy Ghost. Ask a recent convert to talk about how he or she was influenced by the Spirit as he or she learned about the Church. Occasionally ask missionaries to include appropriate spiritual experiences in their weekly letter to you. In interviews or in conversations, occasionally ask missionaries about their morning and evening prayers. Ask them if they feel their prayers are meaningful. Ask missionaries how they help those they teach feel and recognize the Spirit. As appropriate, relate to missionaries how you receive revelation on transfers, missionaries who are disobedient or need help, and doctrine to teach.